As a roaster, we look in one direction and speak with farmers, face the other we speak with consumers. Because I visited so many farmers during this visit to Costa Rica it really brought this home to me and what a privileged position we have to tell the stories of what’s going on in the fields. In Costa Rica what I’ve seen over the years as the main issue, has been the system of coffee production with big mills creating their own brands to major exporters and roasters inevitably at the compromise of achieving high quality. So for small roasters like Union actively seeking high quality, this has never had our attention or met our needs. Against that tide, in more recent years, enlightened farmers have been moving away from selling into the big multinational mills and massive powerful co-operatives farms, towards empowering small, independent smallholder farmers with their own wet mills (beneficio) and drying patios. This form of production, where small individual farms pick and process coffee cherries from start to finish, controlling quality right through, although still a small niche, has become more widespread and available in Costa Rica in recent years. We’d been fortunate to participate in this movement since its early days, having worked with Cafetelera Zamorana for several years now, when they first built their own mill. Over the years Zamora family have gradually built up a small Estate farm. But I’ve now got in deeper and explored into this “Micro-mill revolution”and visited more than 10 different nano- & micro-mills which are an even tinier scale indeed. The opportunity to cup their coffee became my revelation. This quality-driven micro-mill enterprise is emerging from tiny volume and defined-farm, coffee producers who have taken total control of the process and now separate their daily lots, mill it themselves and produce the best possible flavours and get the best price. This revolution is possible due to new, small mill equipment and the awareness by small producers who were previously selling coffee into the multinational mills at market price, where it became anonymous by blending with average, poorly harvested lots. Now, with an independent micro-mill, a small farmer can become a true artisan and maximize the cup quality of their coffee, dividing lots by elevation or cultivar and receiving the highest prices for their micro-lot coffees. 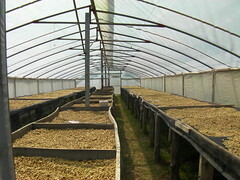 In return, we get exceptional small-lots and a transparent relationship with this small farmer. As a small roaster this gives us an opportunity to bring these boutique lots in a way that is not economical for a larger coffee company and in these cases the farmer receives 200%+ more than the Fairtrade price. I’ve heard this micro-mill phenomenon described is part of the bigger food movement shifting from industrialised agriculture that’s failed to feed the world and the return towards the small scale farmer as artisan producer. It’s bringing Costa Rica away from the agribusiness approach that it’s followed for years that focussed on high yield, disease resistance and driven by (false) economics and scale. Costa Rica is now experiencing innovation and creativity; we’re enjoying pure cultivar micro-lots and honey coffee. The varietals now produced, Typica and Bourbon, and the natural mutations Villa Sarchi and Caturra can be productive and sustainable for many decades, and offer exquisite nuances of aroma and flavour. Compare them to the commercial grown Catimor-based varietals grown to produce a commodity with phenomenal yields but collapses with fatigue in a decade. That’s what you’ll find in your “big brand” pack of “Cost Rica single Origin”. The small scale artisan farmer cannot take this route. With 150 + micro-mills in different microclimates, the revolution is happening and many small-scale roaster buyers like Union are joining because as more, small artisan farmers work to increase cup quality, rather than increase yield, they need like-minded buyers prepared to pay a fair price for their coffee. Honey preparation is a pulp natural lot, where the fruity mucilage from the coffee cherry is left on the parchment during drying. The yellow coloured honey is about 50% removed, Red coloured has about 80% mucilage left on. As the coffee dries it gets gummy, coated in “honey”, feels (& looks) like sugar puffs. The result is parchment that dries to a rich yellow or red colour depending upon how much mucilage is removed. In the cup it is milder acidic and plenty of body. A stimulating richness sensation to espresso shots.